Unfortunately, some education policy folks believe that the more you test students, the smarter they become. This past weekend I participated in a meeting hosted by COMAP where the primary topic of discussion was the upcoming assessments tied to the Common Core State Standards (CCSS). Among the participants were curriculum developers and representatives from both funded assessment consortia, PARCC and SBAC. The assessments produced by these consortia will be the primary manifestation of the CCSS; so the importance of their work cannot be under estimated. As we have learned from previous standards movements, high-stakes assessments will affect, and in some cases derail, the intended focus of standards. For example, assessments generally only measure a subset of the grade level expectations and therefore serve to narrow the curriculum, because schools and teachers concentrate instruction on only those standards that are tested. Additionally, exams have historically relied on test items that can be machine scored (i.e. True/False and Multiple Choice); in an effort to prepare students for these exams, teachers mimic these question types in their instruction. What I learned about the PARCC assessments is nothing short of alarming. PARCC plans to administer quarterly exams (with the end-of-year exam covering the entire year) every year through the 11th grade. This means students will be given state-administered exams every nine weeks. Not only will state assessments intrude on classroom instruction more than they currently do, but PARCC assessments will also determine the pace, content, and sequence of each math class. Assessments by their very nature create goal posts that identify what students should know and by when they should know it. But, by chopping the learning process into nine-week increments, PARCC will impose a rigid curriculum that assumes students will learn, retain, and utilize material in lock step with most other students across the country. Teachers and parents will be shackled to a sequence of topics that does not allow for the developmental variations of students. That is a poorly-informed assumption that will have grave consequences for our students and teachers. 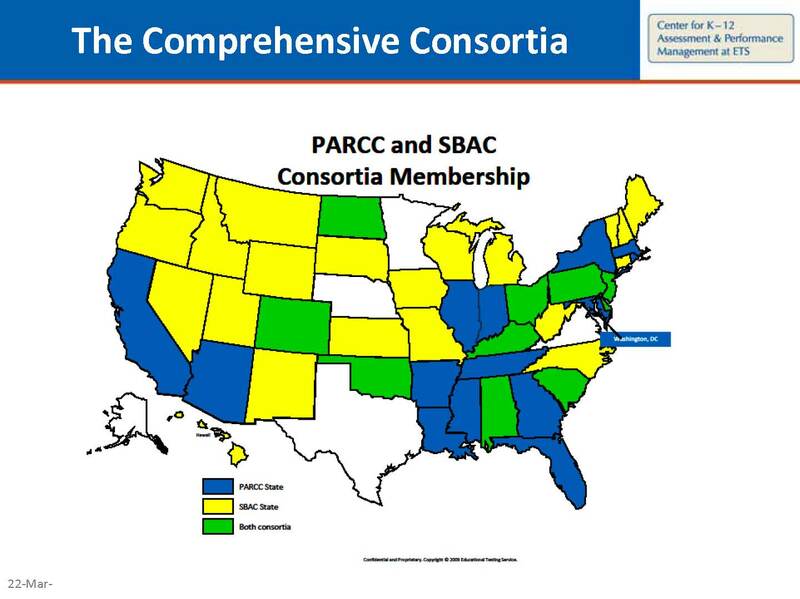 As you can see from the map above, 25 states have aligned themselves with the PARCC assessment consortium. If you find yourself in one of those states, I recommend you write to your state’s leadership and voice your concerns about PARCC’s assessment plan. Previous PostAre We Insane?Next PostModeling: A Mathematical Practice and a Content Standard?